Onslow Engineering Pty Ltd design, manufacture, import and market a complete range of mixers, dispersers, mills, pots and associated equipment for the surface coating industry, processing, mixing, filling and packaging equipment for the food, pharmaceutical and other industries; industrial washing equipment for the meat, bakery, automotive (degreasing), material handling, confectionery and small goods industries; industrial waste equipment. Onslow equipment is supplied to countries around the world. 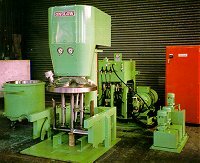 Onslow has been in operation for fifty years with the head office and manufacturing facility located at Wetherill Park, a suburb of Sydney, Australia, and from this location a large range of standard machines as well as custom built machines is manufactured and supplied. Full after sales service and spare parts are available from our Sydney facility.